Since 2011, the share of email opened on a mobile device has surpassed email opened on a desktop client or using web mail, Litmus says. That is just one indicator of the role mobility has grown to assume in just a year's time. In June 2011, about 53 percent of email was opened on a desktop machine. By February 2012, just eight months later, mobile and desktop email openings were about equal. Can Intel Web-Based TV Service Do What Nobody Else Has Done? Intel Corp. has been developing an Internet-based television service that essentially would be a "virtual cable operator," presumably offering the same "bundled" approach to video entertainment as offered by cable, telco and satellite-TV operators. Some believe the venture will launch, or at least be announced, in January 2013 at the Consumer Electronics Show. Whether program suppliers are any more willing to license their key programming assets to Intel remains to be seen. Intel is trying to provide a sort of "beta test" environment by introducing the service "city by city," rather than nationally. Whether Intel can convince programmers that now is the time to infuriate all the rest of their main distributors is the issue. At stake are relationships, already testy, with cable, satellite and telco distributors who pay programmers $41 billion a year in licensing fees. Any significant deals with Intel for a streaming service would put huge pressure on those other existing relationships. Someday programmers will change their minds. But a rational person would argue that the time remains somewhere off in the distance. Ask yourself whether you would jeopardize a business worth billions to gain a new business of millions. That isn't to say you would make the same decision if the choice were "a new business worth billions" to replace a "declining business worth billions." But nobody thinks that is today's choice. So it remains to be seen whether Intel will have more luck than the others who have tried, even if Intel tries a subscription model featuring whole channels and not an "on-demand" model that allows consumers to buy single shows or programs, single channels or single genres. While Intel might like to do so, it is doubtful programmer thinking has changed on those subjects. Time Warner Cable Takes Tough Line on Programming Costs, But How Important is Video, Anyway? For an industry known as "cable television," the notion that "television" is becoming steadily less important is a bit of a shock, at least in one sense. Television revenues are shrinking as a percentage of total revenue as new sources, such as broadband access and voice services, continue to grow. The latest driver of growth, if not yet gross revenue, are business services. Video still drives a big chunk of revenue, though, as does voice for most telcos. 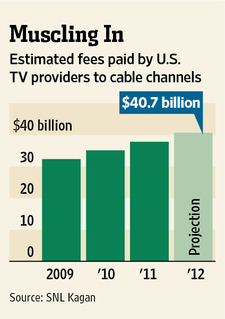 But cable is losing subscribers. And since volume affects profit margins (fewer subscribers means higher per-unit costs), that means the business case is under pressure. Of course, for their own logical business reasons, programming networks find they have to invest more in original programming, which is highly expensive and results in demands for higher payments from cable operators. That means a more-intense negotiating environment than traditionally has been the case. Time Warner Cable and AMC Networks have temporarily extended a carriage agreement for AMC's We TV and IFC channels ahead of a midnight deadline, to allow time for contract renewal talks to continue. To be sure, tough contract negotiations are nothing new for the cable TV industry. It is not uncommon for deals to be reached at the last moment, or even only after some period of lapsed carriage, when channels actually go dark. But those traditionally tough negotiations now occur in a new environment. First of all, demand for the basic product suffers from steady erosion of share to satellite and telco competitors. Also, there is growing concern within the industry that the product simply is becoming too expensive for many would-be buyers. And since programming contract discounts are based on volume, lower volume means higher prices, all other things being equal. There also is another argument, though. Strategically, revenue growth in the U.S. cable industry is no longer driven by video entertainment at all, but by data and voice services, especially services aimed at the business market. As the proportion of revenue earned from the new sources continues to grow, cable operators might arguably gain more leverage, eventually. Consider Comcast, the largest U.S. cable TV company. 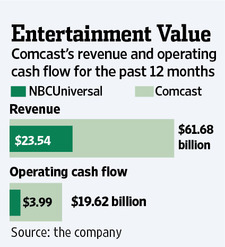 Comcast now relies on its core legacy service, video entertainment revenues, for about 33 percent of total revenue. Comcast has done so in large part by becoming a programming supplier in its own right, as it now owns 51 percent of what once was known as NBCUniversal. And make no mistake, NBCUniversal executives think their programming is undervalued, and plan to press for higher prices. How Time Warner Cable could get to similar levels now becomes the issue. Oddly enough, Time Warner Cable once was a fully-owned division of Time Warner, and was spun out as a public company in 2009. In its second quarter 2012 earnings report, Time Warner Cable earned about 57 percent of its revenue from legacy sources (video entertainment subscriptions and advertising). So 42 percent of revenue earned from "new" sources other than video entertainment. And many would note that economics of the broadband business are better than those of the video entertainment business. In fact, many would say the incremental cost of providing high-speed access ranges between three percent and six percent of revenue at the largest firms, not including the cost of network upgrades to provider higher speeds. Excluding the impact from acquisitions, residential services revenue growth was primarily driven by an increase in high-speed data revenues, partially offset by a decline in video revenues, Time Warner Cable says. Time Warner Cable lost 169,000 video subscribers during the quarter. The growth in residential high-speed data revenues was the result of growth in high-speed data subscribers and an increase in average revenues per subscriber (due to both price increases and a greater percentage of subscribers purchasing higher-priced tiers of service), Time Warner Cable says. Residential video revenues decreased driven by declines in video subscribers and revenues from premium channels and transactional video-on-demand, partially offset by price increases, a greater percentage of subscribers purchasing higher-priced tiers of service and increased revenues from equipment rental charges, Time Warner Cable also reported. Residential voice revenues remained essentially flat as growth in voice subscribers was offset by a decrease in average revenues per subscriber. How Soon Will Video Join Voice and Messaging as a Declining Service? Sooner or later, every legacy service offered by cable TV or telco service providers will face competition from rival services or simply dwindling demand. Up to this point the material impact has been seen most clearly only in voice, where serious financial losses have been felt for more than a decade. But disruption now is being seen in the text messaging space as well. Globally, telecom revenue is growing. But not in Western Europe, it appears. The mobile industry’s combined revenues from voice, messaging and data services in the EU5 economies (United Kingdom, France, Germany, Spain and Italy) will drop by nearly 20 billion Euros, or four percent a year, in the next five years, and by 30 billion Euros by 2020, according to STL Partners. The obvious implication is that mobile service providers in the United Kingdom, France, Germany, Spain and Italy will have to create new revenue streams worth 30 billion Euros, just to stay where they are, by 2020. Though the trend is not always quite so obvious in the U.S. and Canada telecom markets, erosion of fixed network voice lines is assuming alarming proportions in some markets, including the United Kingdom. Some 65 percent of 500 U.K. chief information officers surveyed by Vanson Bourne on behalf of Virgin Media Business believe fixed network telephones “will disappear from everyday use within five years,” Virgin Media Business says. Separately, analysts at STL Partners estimate that, with 2009 representing an index point of 100, U.K. fixed network voice revenues will have shrunk by 50 percent by 2014. Keep in mind, that is an estimate that use of fixed network voice lines will be cut in half in just five years. The latest report on U.S. fixed network voice connections by the Federal Communications Commission suggests that voice connections declined three percent between June 2010 and June 2011. Sooner or later, video entertainment services will hit a wall as well, and the price-value relationship is the problem. Every January, it seems, providers of video entertainment raise their prices, typically outpacing the rate of inflation. For the most part, that remains the case for 2013. DirecTV plans to increase the prices of its programming packages by an average of 4.5 percent, starting Feb. 7, 2013, a move DirecTV attributed to higher programming costs. The company said the programming costs it pays to owners of television channels will increase about eight percent next year, the Wall Street Journal reports. Dish Network will increase the price of its core TV bundles between seven percent and 20 percent in January 2013, with most packages rising $5 a month. AT&T U-verse prices also are going up in 2013. In 2012, Comcast, DirecTV and AT&T raised rates as well. If nothing changes, NPD expects the average subscription video bill to reach $123 by 2015 and $200 by 2020. Bernstein Research analyst Craig Moffett points out that, over the last five years, programming costs at DirecTV have risen 32 percent, for example. But perhaps more importantly, those increases are accelerating, with costs rising upwards of 10 percent year-over-year. "This is a train wreck in the making," says Moffett. Some programmers point the finger at ESPN and the other sports networks. ESPN says its prices are justified by the high ratings the network gets. Some might say sports programming constitutes as much as half of all programming expenses. But prices, in relationship to value, are becoming a bigger problem. Can the Cable Industry Save Itself? Sometimes an industry seemingly is incapable of saving itself. Some might say the video entertainment business could be among them. The issue is less the long term future, where consumers increasingly have the ability to buy what they want, item by item, and more the intermediate period, where rising costs might encourage quite a few consumers to stop buying. To be sure, it is hard to see much material impact from “video cord cutting” so far. Though some would say there is clear evidence of “cord shaving,” where customers drop premium services even while keeping “basic” video services, most “hard numbers” (subscriber counts, for example) suggest that abandonment fo video services remains a potential threat, but is not a clear present danger. “The only way it is going to change in the short run is for government to intervene,” Malone said. If you know anything about Dr. Malone, you know what a truly astonishing statement that is. Lots of observers think video subscription costs, and especially sports network costs, are out of control. But when a legendary industry executive and notable opponent of government regulation says something like that, you know something profoundly important is going on. Malone is warning that the business faces big trouble, and might not be able to save itself without direct intervention by regulators or Congress to restrain programming costs. Of course, it also should be noted that Malone calls for regulators to restrain programmers, not distributors. But Liberty Media has stakes in both programming and distribution, so the observation is not the sort of “help my business, and hurt the other guy’s business” talk one often hears in troubled industries. Of course, over the longer term, Malone seems to agree that the business will be changed, in any case. "People will watch and pay for what they want, it is kind of inevitable," he said. In essence, that could undermine much of the business model for subscription video services. It remains possible that today’s video entertainment suppliers remain key distributors, but perhaps more along the lines of Netflix. But whether those changes will be good for all distributors or programming suppliers is the issue. A reasonable person would argue that programmers will not be able to charge as much as they can at present, if users are able to buy what they want, and only what they want. Nor, one might argue, will distributors make as much money, either. If consumers can buy direct, and save money, they will. Some distributors, ranging from Time Warner Cable to Dish Network have made efforts recently to begin dropping networks, moves intended to send signals to programmers that the days of ever-climbing programming costs are coming to an end. Even the head of the major U.S. cable trade industry association says there is a growing threat of regulator intervention if the industry cannot restrain price inflation. One wonders whether the industry can save itself. Every January, it seems, providers of video entertainment raise their prices, typically outpacing the rate of inflation. “As an industry we have seen increases in double-digit percentages,” said Dish spokesman John Hall. But perhaps more importantly, those increases are accelerating, with costs rising upwards of 10 percent year-over-year. "This is a train wreck in the making," Moffett has said. Uber, a similar service, used dynamic pricing in 2011, on New Year's Eve. The practice will bother some, but in principle it is simply a way of matching supply and demand. Some will say it borders on price gouging, or is, in fact, price gouging. It's hard to say where the boundary between "gouging" (with its implication that a supplier is taking unfair advantage of buyers) and "supply and demand" (the price of a scarce commodity will rise when demand rises and supply is fixed) lies, but supply and demand fluctuations are a reason why prices for virtually any product tend to shift up or down. Communications service providers tend not to have such flexibility, in part because regulators will only tolerate so much fluctuation, in part because users tend to prefer fixed and known pricing, even when their usage might vary, and in part because the ability to dynamically price communications products at the retail level is not always possible (rating systems or billing systems might not be able to do so). Up to this point, service providers have used a simpler "differentiated" pricing scheme, the perhaps-classic example being pricing of voice calls on mobile phones. International calling is most expensive, domestic calling tends to be modestly priced while calling during off-peak periods (evenings and weekends) can be nearly or virtually "free." Some might suggest that "congestion" pricing (bandwidth becomes more expensive at times of high demand) is a similarly beneficial way to match supply and demand on broadband access networks. "Value" pricing is another concept that incorporates supply and demand dynamics, but also seems to provoke opposition from some who think it is another form of gouging. Any number of observers have speculated or argued for "innovative" pricing models for broadband access services, with some arguing for "value-based" pricing. Some might argue mobile service providers are using Long Term Evolution to shift in that direction. Based on a survey of 65 mobile operators offering LTE services, about half "have used the deployment of LTE as an opportunity to introduce a new form of pricing for mobile broadband services." The new strategy, which supersedes the earlier unlimited data model, uses download/upload speeds as well as data allowances to differentiate on price, says Wireless Intelligence. The speed-based tariffs are most common in Europe, where 90 percent of mobile service providers surveyed offer them. These tariffs are less popular across the Middle East, Asia Pacific and Africa, and least prevalent in North America and Latin America. That’s a step in the direction of using tariffs that match service features in a more-differentiated way, even if not such a major step towards dynamic pricing. One basic "rule" of economics is that consumption of any product or service for which there is demand can be increased by lower prices. And that is what Malaysia will do to encourage younger users to ditch their 2G feature phones for 3G smart phones. The Malaysian Communications and Multimedia Commission, as part of its "Youth Communications Package," will subsidize (MYR 200 or ($65 US) purchases of 3G smart phones costing no more than MYR 500 ($163 US). The idea is to encourage use of mobile broadband and encourage youth in rural areas to get connected. The rebate is available for buyers earning less than RM 3,000. According to the MCMC, 89.6 percent of users polled earn less than RM 3,000. And some 87.3 percent of mobile users surveyed are still using basic or fearture phones without smart phone capabilities. The rebate is also only allowed for Malaysians between the ages of 21 and 30. Is the Internet splintering? The question has been relevant for parts of the last decade, and some observers might argue there are reasons why a fragmentation of the Internet could happen, or has already happened. 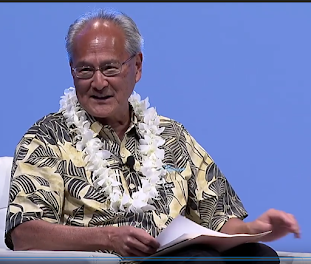 One recent development--an International Telecommunications Union conference that many see as leading to government censorship of content--illustrates the issue. Some argued strongly that allowing governments to control and censor content could spit the Internet into two parts: One free and open one, the other closed and censored, depending on which country you are in. But such legitimate concerns also have other somewhat more logical drivers as well. 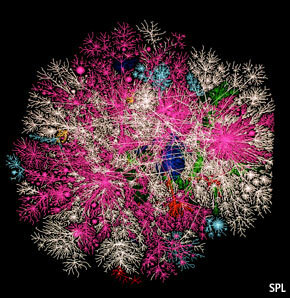 One might argue that even when any human being can communicate with any other human being, the original and still most-powerful value of the Internet, as a practical matter, users are functionally self-segregated, most of the time, by shared language, culture, economic relationships, friendships, application preferences, devices, operating systems and so forth. In fact, one might argue that the formation of communities, which does not conflict with the "any to any" nature of the Internet, itself creates practical and self-chosen "islands." In other words, although it is important that "anybody can connect with anybody else," as a practical matter people communicate and share with a fragment of all Internet users. And there are powerful commercial reasons for doing so, as the notion of an "Internet platform" suggests. That does not mean a free and open Internet is incompatible with use choices to self segregate. The former is the capability that allows the latter. The point is that legal (de jure) Internet freedom has the logical corollary of a tribalized (de facto) use of that fully open resource. Yes, the Internet should remain an "any to any" medium. But people will naturally form communities on a voluntary basis. Formal limits on the "any to any" communications function are harmful. But on a practical level, people will voluntary fragment their use of the Internet. In that latter sense, the Internet will inevitably lead to "fragmentation," in the sense of people forming voluntary communities. As expected, Dish Network is raising public policy questions about the wisdom of the Federal Communications Commission approving the SoftBank investment in Sprint. The raising of such objections is not unusual whenever a material event occurs that one or more contestants believes will be, or could be, harmful to its own financial interests, irrespective of any larger public policy interests. In the case of Dish, which plans to launch its own Long Term Evolution fourth generation (4G) network, the SoftBank purchase of Sprint allows Sprint to create its own LTE network faster, and to use much more of Clearwire's spectrum assets. A stronger Sprint means a stronger competitor to Dish, which will need to get traction in the highly-competitive LTE and mobile markets rather quickly, and will likely face Sprint as a major competitor in the "value" segment of the market. Dish wonders in a formal filing to the FCC whether a foreign company should "control more spectrum below 3 GHz than any one other company in the United States?" Dish asks whether Sprint staggered its acquisition of Clearwire "in two steps in an effort to avoid meaningful Commission review?" Dish also raises the question of whether the FCC needs to look at the competitive implications of the changed spectrum ownership. Some of the potential objections are procedural, some relate to evaluating the impact of the merger on market competition and some raise "foreign ownership" or broader "fair trade" issues. The filing of such comments is a normal and expected part of the review process. A similar flurry of comments and questions were raised by competitors who objected to AT&T's bid to buy T-Mobile USA. But virtually every proposed FCC action will have consequences for contestants in some section of the communications business, and that always leads to filing of comments. Even apparently "operational" issues, such as the accuracy of maps, can be the subject of serious filings with the Commission. The reason is that those maps play a role in helping the FCC determine where to allocate support for rural broadband. Contestants who want to stave off funding for competitors will try to point out that a particular area is in fact not "under-served," and therefore the local telephone company does not need more support. Telcos, on the other hand, have a vested interest in proving an area is under-served, and furthermore that the telco is the best recipient of the funding. By 2015, 33 percent of consumer brands will integrate payment into their branded mobile apps, according to Gartner. That illustrates the evolution of mobile apps from a variety of information and communication purposes, consumer support or experience enhancement, to transactions. This the will be more pronounced for brands with retail outlets, such as those in the fashion, food and drink, grocery and entertainment sectors, Gartner says. Data released by IBM shows that mobile traffic to e-commerce sites in 2012represented an average of 26.5 percent of all site traffic (up from 15.8 percent in 2011) and sales from a mobile device are now at 14.1 percent of total site traffic, according to iconnect. Users of Gmail's calling features in the United States and Canada will continue to be able to make free domestic calls through 2013, Google says. Gmail's voice feature was introduced in 2008 and was said to support such free calling for an introductory period, and has been extended every year, about this time, since late 2008. Since Google incurs real termination costs for delivering those calls, there cannot be any assurance that the policy will continue indefinitely. Nor, apparently, does Google necessarily think providing voice services is necessarily a great way to make money. Voice generates lots of traffic. It is a very "sticky" application. Voice usage adds one more dimension to a social graph. Knowledge of how voice gets used makes it easier to understand a user's social context and interactions. Given the huge value advertising, especially targeted, personalized advertising and marketing has for Google, voice therefore has strategic value. Google arguably is not interested in providing "unified communications" as such. But Google might be very interested in mining the relationships, circles and interactions between people who use Gmail. For most companies, that would not be a value great enough to essentially give people "free calling" services. But Google is not like "most companies." SK Telecom, KT and LG Uplus in South Korea are launching “joyn” services to combat inroads being made by over the top messaging services. At first, each carrier will operate joyn as a service available only to users of its own network, but interoperability between the three carriers is expected in 2013. Joyn, the brand created to support Rich Communication Services (RCS), allows customers to make Internet-based voice calls and video calls and send chat messages as well. Joyn supports individual and group messages of up to 5,000 characters,, Yonhap news service reports. In South Korea, KakaoTalk is among the rival services mobile service providers must contend with. The service is initially available on 22 different types of Android phones, and can be downloaded from each operator’s app store for free. SKT says it will announce extended Android support and an iOS version early in 2013. Messages to non-users will be sent as text messages, as is the case with Apple’s iMessage service, while a PC-based version is slated to launch in Korea in the first quarter of the new year. SKT says the service will be free for users of its flat-rate 3G and LTE tariffs. For all other customers, chat and text messages will be charged at 20 won ($0.02) and video calling upwards of 0.6 won per second (that’s circa $0.03 per minute). Some think joyn will face major obstacles. KakaoTalk has more than 70 million users worldwide and, in its native Korea, is installed on more than 90 percent of the country’s smart phones. Smartphone messaging apps are hugely popular across Asia. Alongside KakaoTalk, China’s WeChat (near-300 million users) and Japan’s Line (85 million) have grown massively in 2012. Of course, the issue is less the installed base of apps but the volume of WhatsApp messages being sent and received by mobile users. But not all mobile service providers seem to think joyn is the more profitable way to compete in the messaging market. The logic is simply that the OTT apps already have achieved such large installed base and scale that any new entrant will have trouble dislodging users. Indonesian carrier Telkomsel in fact has partnered with Kakao Talk, rather than participaing in the joyn effort. But it would be fair to argue that most service providers will try joyn. In Spain, Movistar, Orange and Vodafone, Spain's three leading mobile service providers, have launched "Rich Communication Services" using the joyn brand. Spain has been the first country in the world to offer a fully interoperable carrier-owned over the top voice and messaging app, meaning that any customers of any of the mobile service providers can communicate with each other. In Germany, Deutsche Telekom and Vodafone both support joyn, and the leading South Korean mobile operators appear to be following that approach as well. The idea is that joyn will allow mobile service provides to create a very large community of users, with access to "rich" voice and messaging ("rich" generally implies support for video) features. That scale effect might ultimately be crucial for joyn success, as well as the ability of mobile service providers to blunt the over the top messaging app attack. There are about three or four different ways mobile service providers globally can react to over the top messaging. About half the options are hostile or unfriendly to the consumer. Carriers can block use of over the top apps, or charge extra fees for people who use the generally free apps. Neither of those approaches are especially desirable in competitive markets where another provider will avoid blocking or charging. There are two approaches that are less surly ways of approaching the problem. Joyn is one way of competing with a carrier-owned alternative intended from the start to be a "third party" brand. In other cases, carriers have created their own branded OTT apps. The level of competition in a given market tends to suggest whether mobile service providers should offer their own OTT apps, or avoid doing so. In markets where voice and messaging revenue already is sharply declining, competing might be the only choice. In other markets, where there is less pressure, service providers generally will resist jumping into branded OTT voice and messaging apps, to avoid cannibalizing carrier voice and messaging. In other cases, as with Verizon Wireless, carriers simply offer unlimited domestic calling and texting as a basic network access fee, to undercut the value proposition of the "free" OTT apps. That arguably works best where there is a very-large internal calling market. Between 2009 and 2020, the amount of consumer spending in the Asia-Pacific region will nearly have doubled, and will represent the largest single regional volume of spending, outstripping Europe, North America, Central and South America and the Middle East and Africa. That will have important ramifications for providers of communication apps and services, creating much larger markets than ever have been seen in those regions. 36% of U.S. Households Might be "Wireless Only"
Some 35.8 percent of U.S. homes did not use or buy fixed network telephone service during the first half of 2012, an increase of 1.8 percent since the second half of 2011, according to the latest survey and report by the Centers for Disease Control. In addition, 15.9 percent of U.S. adults received all or almost all calls on wireless phones despite also having a fixed network telephone service. The only thing that would have been surprising about the latest survey is if the wireless substitution trend had stopped or reversed. CDC does not that the rate of substitution has slowed to 1.8 percent over the first six months of 2012. CDC says that is the slowest rate of increase since 2008. At current rates of change, in about a decade, about 70 percent of U.S. adults would be "wireless only." As has been the case in earlier CDC studies, four demographic groups primarily account for the "wireless only" preferences. Younger adults aged 25 to 34, adults living only with unrelated adult roommates, adults renting their home, and adults living in poverty are those groups. Among households with both landline and wireless telephones, 29.9 percent received all or almost all calls on the wireless telephones between January 2012 and June 2012. These wireless-mostly households make up 15.9 percent of all households, CDC says. The shift to mobile forms of voice service also corresponds with a shift of household spending on voice, Internet access and video services. Since 2001, spending priorities have shifted to mobile, Internet and video, as fixed voice spending has dropped, according to Chetan Sharma. Researchers at the International Telecommunications Union and Pyramid Research likewise believe the same basic trends will occur. Over the 2000 to 2014 period, fixed voice subscriptions will decline by 50 percent, while mobile subscriptions will grow by 100 percent. Evaluating use of the Internet and broadband is getting more complicated by the day. For starters, mobile now represents a majority of Internet access activities. And it sometimes is hard to comprehend just how fast that has happened. Consider that, in the G-20 countries, mobile broadband went from negligible to a majority of all access connections in just five years, between 2005 and 2010, according to Business Insider. In five more years, in 2015, mobile G-20 Internet connections will be about 80 percent of all connections, Business Insider estimates. That has some clear implications for the way we evaluate “broadband” penetration. For starters, “mobile” access might be more important, more of the time, than fixed modes. Traditionally, the reason for buying broadband access services was for fast Internet access for some sort of PC, at a fixed location. These days, there are other reasons beyond “PC access,” and many more situations where “mobile broadband” is preferred. Some users might want a fixed connection, solely or in part, to offload data sessions from a mobile network to a fixed network, to get access to the Internet from some other devices, such as a tablet or iPod. Some might want broadband access to support Internet access for game playing consoles or some other video device (Roku, for example) that displays Internet video on a TV. In other words, there are many more devices, other than PCs, that derive value from a fixed network broadband connection. Notably, a Business Insider poll suggests 45 percent of users are doing their browsing on a tablet, 24 percent on a notebook and 17 percent on desktop PCs. About 14 percent of browsing now is conducted on a smart phone. public places are included, according to Nielsen. But Hispanics are less likely to have Internet access at home compared to the U.S. average (62 percent and 76 percent, respectively). So is that a problem? Yes, but a problem that is solving itself, it appears. Over the past year (2011 to 2012), Hispanics increased home broadband use by 14 percent, which is more than double the six percent growth of broadband use in the general market. compared to three percent, respectively). In other words Hispanices, as blacks and Asians, “overindex” for mobile broadband. In other words, many segments of the U.S. population, for example, prefer to buy mobile broadband than fixed broadband. It is a truism of economics that price and sales are directly and inversely related . In other words, lower the price of a product and consumers tend to buy more; raise the price and consumers buy less. In fact, the whole point of some public policy policies (taxes, rebates, subsidies, penalties, credits, tolls, fees) is to dampen demand for some products or encourage demand for some products. Communications markets are not exempt. Raise prices and people can be expected to consume less; drop prices and people theoretically buy more. But that only works up to a point. Demand for the product, and ability to supply it, has to exist. And that is getting to be a problem for some communications or entertainment products. Demand for streamed versions of items in the Netflix catalog is growing; demand for disc rentals is shrinking. Presumably Netflix could drop prices for “DVD only” versions of the product. But consumer preferences are shifting, and it is not clear whether even significant price drops would reverse the streaming versus DVD by mail volume changes. You might argue something similar is happening with mobile voice and fixed network voice, or video entertainment subscriptions. To be sure, there’s a relatively simple reason people globally prefer to use mobile for voice. In many markets, mobile is the only way to make a call. In 2010, about 90 percent of total call volumes in Brazil, Russia and China occurred on a mobile device. That is a market where there is no functional substitute product, so fixed network voice pricing isn’t relevant. In other markets where both mobile voice and fixed voice are available, mobile is cheaper than using fixed services. In these markets, retail pricing and packaging, not just user preferences, drive usage. Classical economics would suggest the suppliers could increase buying and use of fixed network voice services by dropping the price. Some would argue that is precisely what Skype and cable digital voice services have done. In the video entertainment business, the price and volume consumed trends are not so pronounced, yet. But some surveys suggest not only that the problem of actual cord cutting is growing, but that demand is the issue. The implication is that even a price cut for video subscriptions might not work to stimulate demand, on the part of some growing percentage of consumers. About 33 percent of people who have “cut the cord” on their video entertainment subscriptions would not buy again, even if prices were cut in half, a study by TechBargains.com has found. That opinion illustrates the level of growing dissatisfaction with video entertainment services sold by cable, satellite and telco TV providers, at least in some consumer segments. Despite the fact that 83 percent of surveyed cord cutters abandoned their video entertainment services because of the “high cost,” even a price cut in half would not be enough to entice many cord cutters to buy again. Significantly, the study also suggests that video entertainment services are not even viewed as providing the best quality and variety of programming by 17 percent of people who disconnected their cable TV or satellite TV services. For an industry that claims to provide the best quality and variety, that is a problem. Another possibly-significant finding is that consumers who abandoned their fixed network phone service were two times more likely to eliminate their cable TV or satellite TV subscription than those who have not disconnected their home telephone. Of respondents who have gotten rid of their landline, 36 percent also discontinued their cable TV or satellite TV service. Of respondents who still have their landlines, 19 percent have cut the cable cord. The survey found that 60 percent of respondents no longer have a landline telephone service, either. Although the survey also found that 57 percent of people that still have a landline voice service do not plan to disconnect their landline in the next year, that statistic might be only mildly reassuring, since it suggests that 43 percent might cut the cord on their fixed network voice service within a year or two. The Federal Communications Commission Technology Advisory Council has estimated that U.S. time division multiplex fixed consumer access lines could dip to perhaps 20 million units by about 2018. Others, such as Kent Larsen, CHR Solutions SVP, think lines overall could dip to about 50 million over the next five years, then to about 40 million on a long term and somewhat stable basis. Keep in mind that the U.S. market supported about 150 million voice lines in service around the turn of the century. One might argue, under such circumstances, that even lower prices would not entice many consumers to buy fixed network voice again. What Does Dish Actually Want from LTE? Will UK 4G Auction Change Market Structure? Is Advertising a Violation of Network Neutrality? "Voice" Increasingly is Synonymous with "Mobile"
Can Carriers Afford "Unlimited" Internet Access? Can Service Providers Raise Prices? What If They Hold a 4G Auction and Nobody Bids? How Many Voice Lines in Use by 2018? Is Sprint Moving to Take Over Clearwire? Will Data Demand Keep Growing at 60% a Year? How Do Tablets Get Used at Work? Mobile Operators Say Small Cells "Essential"
What Will Apple Do "After" iPhone?